"Sampath Speaking" - the thoughts of an Insurer from Thiruvallikkeni: ascending the summit of Mount Everest ~another perspective ! ascending the summit of Mount Everest ~another perspective ! The World’s highest mountain peak *Mount Everest* is called Chomolungma in Tibetan and Sagarmāthā in Nepali. It is 8,848 metres (29,029 ft) above sea level, located in Mahalangur section of the Himalaya on the Nepal-China (Tibet) border. Turning the annals of History, in 1856, the Great Trigonometric Survey of British India established the first published height of Everest, then known as Peak XV, at 29,002 ft (8,840 m). In 1865, Everest was given its official English name by the Royal Geographical Society upon recommendation of Andrew Waugh, the British Surveyor General of India at the time, who named it after his predecessor in the post, and former chief, Sir George Everest. More than 3000 climbers from over 20 countries had made over 5000 recorded climbs. Hundreds have died in their attempts. Sir Edmund Hillary and Tenzing Norgay were the first to reach the summit on May 29, 1953. Tenzing Norgay was a Sherpa. There are two main routes to the top, one from Nepal and the other from Tibet. The southern route from Nepal is the most popular, and the simplest to do. There are also 16 other recognised routes. Of the many, I had posted on some climbers - Adam Craig Parore, a stylish wicket keeper, who played 78 Tests and 179 One dayers for New Zealand was one. In 2012, Chhurim Sherpa did it twice -- in one week ~that becoming a ‘Guinness World Record’ formally recognized after almost an year. Mark Inglis in May 2006 – a double amputee climbing the highest peak !.... This post is on a former banker, 5o, who has conquered SEVEN peaks including Everest and her statement that she can afford to climb mountains because she has no 'expensive children' to fund !! A banker who turned her back on business to climb Everest and says being able to climb mountains is ample compensation for never having children. Vanessa O'Brien, 50, who worked in banking for 20 years before quitting during the recession, says she can now spend thousands on expeditions because she doesn't have 'expensive children.' And her British husband is happy to cut back on his own lifestyle to help fund her expeditions, which can cost up to £50,000. Vanessa, MailOnline states that decided not to try alternative methods after not conceiving naturally with husband Jonathan O'Brien. The former Bank of America employee met her husband of 13 years, Jonathan O'Brien, 48, while living in London. The couple tried to have a family but after she did not conceive naturally, they decided against alternative methods like IVF. Now, she has climbed the Seven Summits, the seven highest mountains in seven continents, as well as trekking through Antarctica and the Arctic to both Poles. Vanessa grew up in Michigan, US, and moved to London in 1999. Working in consumer accounts for many large bank firms like Bank of America, Morgan Stanley and Barclays Bank, it was in 2010 when the recession hit, she had a change of heart. Jonathan is concerned about Vanessa attempting to climb K2, which has killed 80 climbers but supports her and trusts in her climbing capabilities. Vanessa, has climbed Manaslu the eight highest mountain in the world, and has a Guiness World Record for being the fastest woman to climb the Seven Summits in 2013. She said: 'That was the main catalyst and turning point. It was such dark times, not that it's changed completely. 'I walked down the high street and shops were boarding up and closing, people were clearing out their offices. I was looking to climb up and out of it. 'My grandparents went through the Great Depression, this wasn't something that was meant to happen to us.' It was when a friend suggested that she take on such a huge challenge as a joke that she decided to take up mountaineering. Vanessa trains by running up and down underground station steps as it mimics the altitude. When her friend jocularly asked, Vanessa had no idea how to climb, but she wanted a new project and realised Everest wasn't such a flight of fancy. She said: 'I was thinking, "What takes two or years, which would measure success or failure and challenge me". In 2010, she went to Everest base camp in order to see what it would be like and was so inexperienced sherpas had to help her put on her crampons, metal spikes fixed to the shoe for grip. In those two years she was also saving for the sheer cost of climbing Everest, which can be around £50,000, including flights. She's also the quickest woman to complete the Explorers Grand Slam of reaching the last degree of both the North and South Poles. She said freezing temperatures don't bother her as it's always cold in her native state of Michigan. 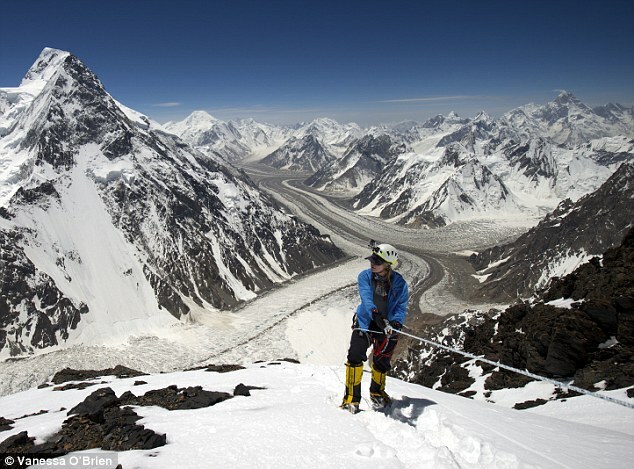 Vanessa, who moved to Boston, US, in 2012, is currently embarking on the challenge of climbing K2, in Pakistan, but was thwarted in July when conditions prevented her from climbing and could only reach base camp three. Vanessa, does't want others to follow her example as mountaineering is too risky for many and can end in fatality. The deaths have been attributed to avalanches, storms, altitude sickness and falls from the mountain face. With 302 summits and 80 fatalities, about one person dies on the mountain for every four who summit.